We are in a very dark time. Not metaphorically—although perhaps that, too—but this time of year is the darkest. The lack of light can cause a lull in spirit and a disconnection from our essential selves. We forget that we are more than these tired, hard-working, chore-accomplishing, gift-buying, meal-baking, email-checking bodies. We don’t remember we are filled with light; that our every breath, step, thought, and deed manifests Godliness into the world. 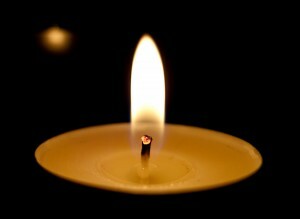 To help dissolve heavy feelings during these long nights of winter, try this candle meditation from the Zohar*, a thirteenth-century mystical commentary on the Torah. This simple, safe, and affective exercise will illuminate your spirits and return your awareness to the preciousness of your existence. It will remind you of who you truly are. If at anytime you become lost in the explanation or various levels and meanings described below, relax. Don’t bother with the details. Just sit and gaze at the flame, and breathe. When to do it: Try it when you light the Chanukkah lights next week, or Shabbat candles, or anytime, really, that you can take a few moments (or more) to light a candle and be. 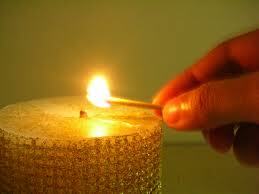 Place the candle in front of you and light the wick. Sit in front of the lit candle in a comfortable, yet alert posture. Try to have your spine erect, but not rigid. 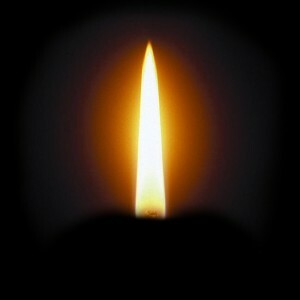 Slowly, bring your awareness to the candle and the candle flame. Breathe. Notice your belly moving as you inhale and exhale. Breathe in slowly and breathe out fully. Continue to do this for a short period of time. Recognize the miracle of your breath. Bring your attention to the base of the candle(s), which represent(s) your body, your mind, and your personality. The base of the candle symbolizes all that is you in the physical world of form. Continue to breathe in and out. As your gaze softly focuses on the body of the candle, feel the strength and purpose of your body, your mind, and your personality. After a few moments, move your attention to the candle’s flame and glow, which corresponds to three levels of Divine light. 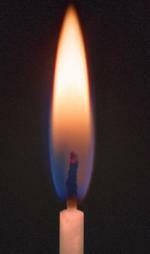 Just above the base of the candle is a blue-black flame. This represents the part of your spirit manifesting in the world through each and every one of your actions, your thoughts, your deeds. At this level of soul, the nefesh, the relationship between body and spirit is interconnected, interdependent. What you say and do and think—who you are—in your day-to-day life manifests Divine light into the world. This level of spirit infuses your every cell, your entire being. Your breath feeds the Divine; the divine nourishes you. Obviously, as a human, your thoughts, words, and actions change form and shape from day to day, minute to minute. Sometimes you are in a deep and brooding mood, sometimes you are experiencing vast expansion and joy. The possibility of expression is endless. So too with the blue-black flame. It changes from blue to black and sometimes to red. These colors represent your myriad emotions and moods, which are always shifting. Breathe within for a few minutes. Now bring your attention to the white flame. Just above the shifting blue-black colors, the white flame is steadfast and constant. As you gaze into the white flame, feel into yourself for the pure spark within you. Consider the truth of your unwavering purity. The Divine flame is always present within you, at peace and tranquil and independent of your beliefs, emotions, moods, errors, accomplishments, etc. The white flame represents ruach, your unflinchingly steady and present spirit that remains aglow regardless of circumstance. Continue to gaze and breathe with this awareness for another few minutes. Next, bring your attention to the glow around the candle flame. This blushing luminosity represents the highest level of soul, the neshama. Although it always is present, typically we cannot see this level of spirit. Here, however, we can gaze at its representational radiance, visually take in its presence, and recognize the essence of all creation. Each of us and everything is made of this light and love. Though we often live only within awareness of our ever-shifting—blue-black-red—levels of emotions and experiences, all levels of the Divine exist within us always. Remain focused on the candle, its flame, the glow, and your breath. Allow your awareness to relax and expand. 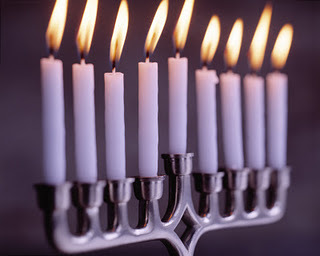 Use this candle meditation throughout the month of Kislev, when the nights are their longest. When the weather and light feel cold and dark, stare at a candle and its flame. Breathe in and connect to the Divine radiance that is you and that surrounds you everywhere. I”m interested in your thoughts, experiences, and insights. Post a comment and spread your light. *This safe and simple, yet also deep and reassuring candle meditation from the Zohar was taught to me at the turn of the century by Hana Matt. I keep many of Hana’s teachings tucked into my heart; always I send her and her husband, Daniel Matt, blessings of love, strong health, and happiness.